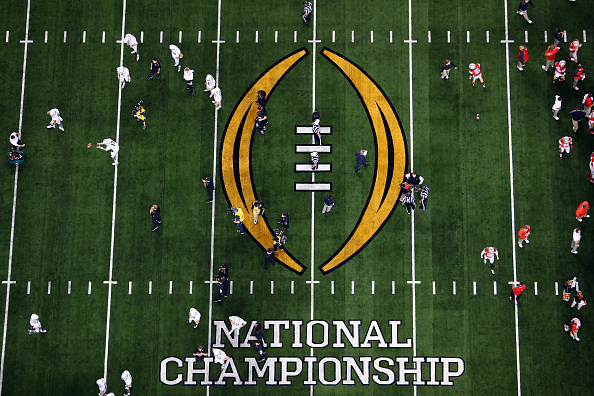 during the College Football Playoff National Championship Game at AT&T Stadium on January 12, 2015 in Arlington, Texas. It will be tough for Oregon to compete with Ohio State again this season. The defending BCS Champion Buckeyes are stacked once again this time around with proven talent. The Ducks meanwhile, are in search of a few key pieces to regain and redefine their identity. 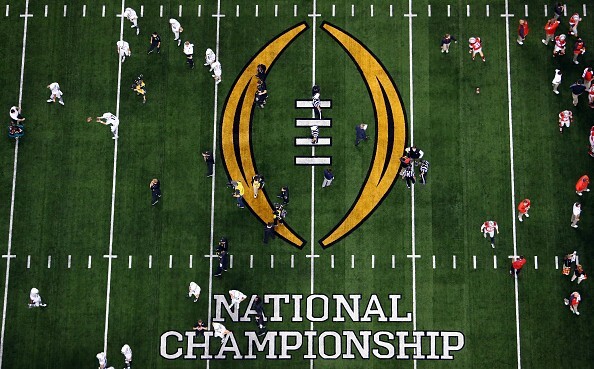 Ohio State is primed for a return to the big game, but Oregon, not so much. Online sportsbook TopBet lists Ohio State at +175 and Oregon at just +2200. The Buckeyes Heisman Trophy contender Ezekiel Elliot ensures another solid ground game can be expected, while the team also has three capable quarterbacks to choose from in J.T. Barrett, Cardale Jones and Braxton Miller. On defence, the Buckeyes are still as solid as ever despite losing CB Doran Grant (Pittsburgh Steelers – 4th Round) and DT Michael Bennett (Jacksonville Jaguars – 6th Round) in the NFL Draft. Big Ten Defensive Player of the Year and possible 2016 draft favorite Joey Bosa leads a group of eight returning shutdown defensive players. Expect the Buckeyes to be very strong once again, on both sides of the ball. Meanwhile, the Oregon Ducks will have to find their feet in 2015 with some different faces. Most notably at quarterback, second overall draft choice of the Tennessee Titans and former Heisman Trophy winner Marcus Mariota will no longer be under center. From the looks of it, Jeff Lockie will get the QB reins to start the season. However, with Vernon Adams Jr’s transfer nearing completion, the former Washington State Cougar could be the go-to guy in Eugene before you know it. At running back, thanks to Thomas Tyner’s upcoming shoulder surgery, Royce Freeman will get the vast majority of the spotlight this season. It’s the second straight year, the Ducks will have to find their way without Tyner’s help. Tyner missed four games last season with a shoulder injury and will now miss the entire 2015 season with the needed surgery. It’s not the end of the world for the Ducks, as it looks like senior running back/wide receiver Byron Marshall will check in for Tyner. It is undoubtedly a big hit to lose one half of, what was once considered, one of the best running back tandems in the country though. The team lost one of their anchors on the defensive line in Arik Armstead this past offseason to the NFL. He was selected 17th overall by the San Francisco 49ers in the draft, meaning the team will have to replace his 46 tackles and 2.5 sacks in the trenches. The man filling his shoes will be defensive end Canton Kaumatule. Head Coach Mark Helfrich liked what he saw out of the freshman during the spring and has high hopes for the young man in 2015. Even if Kaumatule breaks out though, it is going to be an uphill climb for the Ducks to regain their Western supremacy this season.